There are few things as awe-inspiring as gazing at a sky full of stars on a dark night. As humbling as it is to contemplate the universe and our place in it, knowing we’re made of star stuff — according to astronomer Carl Sagan, anyway — is pretty cool too. Unfortunately, too much light pollution makes stargazing in the modern world pretty much impossible, especially for large metropolitan areas like New York City. Being the city that never sleeps, it makes sense the Big Apple would have this issue. From Broadway to Times Square, its millions of dazzling lights sadly obscure the natural beauty of the night skies. But imagining what areas like New York City could look like without such large amounts of light pollution is exactly what the Skyglow Project is all about. 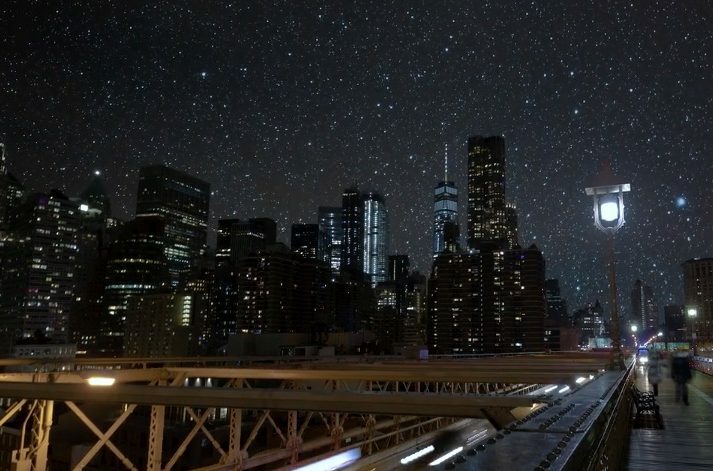 Spearheaded by photographer Harun Mehmedinovic and filmmaker Gavin Heffernan, Skyglow NYC, the project’s latest release, is a breathtaking video that somehow captures both New York City’s existing beauty and how it could look even more captivating without light pollution. Using sky mapping, Mehmedinovic and Heffernan are able to make videos showing these unbelievable starry skies. Sadly, though, the only way we could experience this in real life would be if New York City had a blackout — for several days. Still, if you want to see a few extra stars wherever you live, there *are* ways we can all help cut down on light pollution. International Dark Sky Week 2018, which runs from Sunday, April 15th through Saturday, April 21st, encourages everyone to turn off lights to help turn up the sky’s natural glow. The holiday of sorts also stresses the importance — and benefits — of energy conservation in our own individual lives. "Humans are not immune to the negative effects of light in their nighttime spaces," the International Dark-Sky Association website reads. "Excessive exposure to artificial light at night, particularly blue light, has been linked to increased risks for obesity, depression, sleep disorders, diabetes, and breast cancer." Turning off an extra light or two might not seem like a big deal, but if it can put a little more twinkle in the sky — and help us get a better night’s sleep — we’re all for it.